Spam Wars – The spammer lost in court, but will they pay? 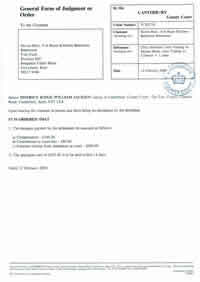 It’s arrived, the County Court Judgement against the spammers known as Cybernet Media Limited and Chris Mortimer. The court awarded me 100 in compensation and a further 325 in costs (425 in total). The big question now is will they pay? They have until the 28th February. I admit this still isn’t really what I wanted. In the original court documents I asked for two things. Firstly, for them to pay the charges I told them I expected them to pay if they continued to send spam – at a rate of 50 + VAT per email. The judge said he couldn’t award that because it didn’t reflect the costs their breaking the PECR regulations incurred me. In his words, I could have asked for a million pounds per email and it wouldn’t be a valid claim. If however those particular emails had stopped our system working and the repair had cost a million pounds then that would be allowable. I’m not unhappy with the judges decision, it’s perfectly logical, but I understand why others don’t bother trying to stop spammers – it’s simply not worth the time. Secondly, I asked for them to put in writing that they would stop sending the spam and follow the regulations. The judge couldn’t order that (not within his powers) and as we know from reading the comments of my earlier posts Cybernet Media continue to send spam, not because they don’t know the regulations, just they choose to ignore them. I’ll update the blog if there are any developments. Having won one court case do you have the enthusiasm for another? It seems that it has been established that their method of mass marketing does not meet the regulations. Does this mean that they really do not have permission to send you these unsolicited messages? Not merely that you don’t want the messages but that a court has confirmed that the actions are wrong. The judge didn’t have the power to order them to comply with the regulations. But, it sounds like he would have liked to issue an order. It has been established that they have been informed that you do not want to receive their spam and that their mass marketing does not meet the regulations. Does this now mean that the next message you receive from them is in contravention of The Computer Misuse Act 1990 Section 1 (Unauthorised Access). They caused your computer to perform a function (retrieve and display the message) while knowing that this action was unauthorised (you explicitly stated you did not want to receive the email). Hi. Wel done on your court case. I too am considering taking this company to the small claims court, but for none payment of an invoice. Do you have any tips? Can you confirm if they have paid the court judgement? Did you use legal assistance or did you do it all online? How did you cope with Chris Mortimer not being the guys real name? (I think I know his real name, but I’m not 100% sure). Did they pay up? I’m getting spammed by this lot and may do the same as you if it’s worth it…. Hi Steve – did they ever pay up? Getting annoyed with this “company’ myself…. Not yet…. so late last year I started the next stage of the court process. They’ll be hearing from their local court shortly and I’ll post an update when I hear more. Lol I just came across this post. Cybernet have cold called our company a few times in regards to SEO and this last time regarding a PPC campaign I run on our company. The basically tried selling me a service which will block all the IPs from competing companies so they cant click on our ads. This is quite easy to do in Adwords and also using other tools but the problem is getting your competitors IP address. I asked him how they acquire it, and he said “Thats what we do its our job” so I asked again how exactly they acquire the IP address and he fobbed me off again. When I said I wasn’t interested in the service he got angry at me saying do I not want to save money! I explained we only spend 100 a month and most of our enquiries come through organic listings. He then tried to say we dont have any organic listings and refused to believe the examples I gave!!! What an idiot. While it is easy to capture IP addresses how does he honestly think he can get ALL my competitors IPs? It’s a bit long winded but you’ll get the gist… plus I’m sure there will be a few people on there who are interested in knowing how you contact these people. Did you ever receive the money from the spammers? I can’t see a follow up post. I’m considering taking legal action against some spammers and want to know whether it’s worth the effort (and money) involved. If they can just ignore judgements against them the whole process seems pointless. I learn’t a lot from all of this, and I’d summarise it by saying: “Most of these laws are pointless and unenforceable”. They may be created by governments with the best of intentions, but they’re not enforced. On the civil law side, the system won’t support you trying to enforce them. In other countries a court order is payable to the court, so the court follow it up. In the UK you have to follow it up yourself. I gather it’s a criminal offence to ignore, but the court aren’t following it up anyway and I never figured out how to get to the point that they would. Court bailiffs eventually went to their home addresses (that they have registered with companies house, public info as they were a limited company) and apparently they didn’t live there. I tried to report this to Companies House but they had no interest either (although having invalid addresses breaks the company regulations iirc, which I gather is then part of criminal law). On the criminal law side, the ICO try to educate before litigate (sensible), but they’ll only be interested if there are thousands of people affected as they can’t handle the workload otherwise. I don’t think they’ve ever prosecuted/fined a company for email spam, though they have sms spam (I’d have to search their web site to be confirm that though, so you’d have to check with them to be certain). So I’d say it’s not worth the time and effort from a financial point of view. I don’t think naming and shaming does any good though. I guess spam is here to stay.